The Friday Flashback post possibilities get a little lean as we head into the next to last month of the year. 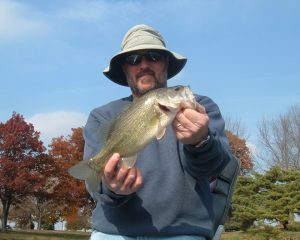 But if the weather cooperates in a reasonable fashion and I can find time to get away, the annual goal is to put a November bass on the board. Ten years ago I was able to do just that. Below is the original post that was sent to a group of family and friends as my fishing finale from 2008. 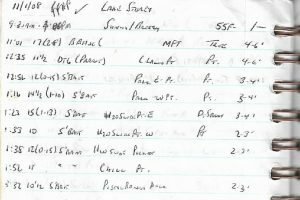 November Bassin’ – Always wanting to push the fishing year as late as possible, I’d held out hope that I could work in a November trip. Fate was on my side and I was able to spend one more day on Lake Storey. 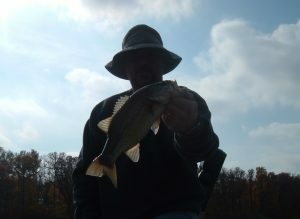 Just over six hours produced nine bass with a 2-8 taking Top Bass honors via a Zoom Baby Brush Hog. Two others gained entry into the record book at 1-13 and 1-10 with both falling to a Quad Blade spinnerbait (white). 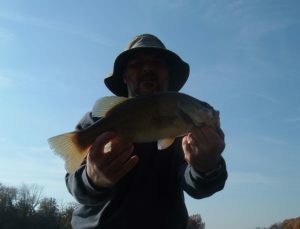 This bait was easily my top producer as it fooled seven bass and a Rapala DT6 (parrot) was responsible for one fish. While this trip failed to add any “accidents”, a nice muskie did take a couple swipes at the spinnerbait but failed to get hooked. It was likely in the mid 30 inch range and really got the adrenaline pumping with a near surface strike roughly ten feet from the boat.